Perfect – Grilled Cheese and Wine on Sunset Blvd. Quick: What’s the most satisfying meal you’ve ever had? I bet you have several. The perfect meal is hard to pin down because they’re all about context. Where are you? How hungry are you? Who are you with? Where did you just come from? What did you do just prior to this perfect meal? Like you, I have several perfect meals. None of them are fancy. In fact, most are not even technically “meals.” They’re more memorable tastes. For example, whenever I go to Berkeley my first stop bar none is Gordo’s Taqueria, where I sit and eat my black bean, cheese and rice burrito (with just a dollop of sour cream) in a state of complete and silent bliss. In Santa Cruz there’s a bistro called Gabriella’s that serves fresh figs wrapped in prosciutto…the only possible response to which is delighted, astounded, laughter. In North London there’s a storefront restaurant with samosas that will render you mute, especially if you haven’t had a bite of Indian food in eight, nine months but have spent every day of that time daydreaming about it. The crawfish at Felix’s in Orange. The blue fin tuna at Asenabo in Studio City. The egg bagel just out of the oven at 108th and Broadway in NYC. That salt cod and garlic dish a friend made on New Year’s eve 1999. The meat and potato stew my neighbor brought over an hour after I gave birth to my son, at home. A bowl I finished in minutes and literally licked clean, while my neighbor, a big and radiant woman from Kenya, laughed all the way back to her apartment to retrieve the entire pot for me. Here’s a more recent perfect meal: A grilled cheese sandwich and a pickle. Washed down with a $14 glass of red wine. Tony and I discovered this one at Greenblatt’s about a year or so ago. Greenblatt’s is a Jewish Deli on Sunset in LA. It’s been there for at least 50 years. It’s got much better food than the more famous Canter’s Deli on Fairfax. As well as a vaunted wine collection. It’s open late and we like to go after a show and slump in a booth and watch the Hollywood people come and go. One night we were trying to decide what to eat. “Know what I really feel like?” Tony looked over his menu sheepishly. My last experience with grilled cheese had something to do with a slice of American cheese between two pieces of Wonder Bread. There is a lot to choose from on the Greenblatt’s menu, all of it worthy. So eyebrows were raised. But not for long. Imagine a place that serves grilled cheese sandwiches for adults…yeah, I know. Tart up a grilled cheese and call it a panini. 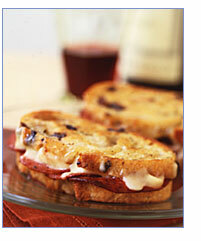 It’s still just a grilled cheese to me — and that can be more than OK. Tony ordered jack cheese on rye bread. Creaminess with a bite. And then there’s that pickle, which is like a satisfying, final exclamation point. I don’t know how we came to order the $14 glass of wine. A cab out of Napa somewhere. Our waiter, the tall and improbably-named Gide, told us it would be good. And who the hell has a decent wine with a grilled cheese? Well, exactly. There’s a lot more to be written about grilled cheese sandwiches. They’re popping up all over. In the Williams Sonoma catalog, in the New York Times (which irritatingly cancels its free links within days), to the food blogosphere. There are contests. All sorts of grilled cheese chatter. They’ve also gotten the nod from the heavens. Seems God, some ten years ago, saw fit to affix an image of the Virgin Mary into a toasted cheese sandwich. True believers have been making pilgrimages to see this holiest of grilled cheese in Florida (where else?) until recently, when it was sold at auction on Ebay for $28,000. I know you have a favorite meal or two. Let’s hear them. I like my grilled cheeses on rye, with a slice of tomato and a sprinkle of chive, between two slices of provolone cheese. YUM! My favorite meal(s) has to be homemade mac and cheese, and beef stroganoff. Both are creamy and comforting, and just absolute perfecting on a plate. Before we return to Gabriella’s in Santa Cruz, and prior to your gentle persuasion (just a bat of your beautiful blues will do) for the purchase of the panini-press from Williams-S., may I in the meantime take you back to Greenblatt’s for a jack on rye and the $14 cab? One of my secrets to a great “Griddled” Cheese or quesadillas is the use of cream cheese along w/ your favorite cheese. Cream Cheese adds more body and structure, along w/ a propper adhesion to the bread pieces. Must use real butter and real cheese, not margerine or generic cheese slices. If you read the ingredients on the package it MUST say “Milk” as the very first ingredient to be the real thing. Just stick to the “Tilamook” brand so you know you are getting quality. Quality bread that has lots of little air bubbles, not the dense cheap white bread slices you feed the kids to make their pitiful school lunch sandwiches. A great brand is “Orowheat” and “Pepperidge Farms” but the best is at your local bakery. I personally like to use Sourdough cause it toasts really well to give that perfect CRUNCH! at first bite. I spread on two slices of bread cream cheese, then Chipotle Jam, then a couple os slices of cheese. Then in it goes into a George Foreman Grill and is pressed till I see cheesy gooey-ness start seeping out from between the slices, and I get a nice toasting and grillmarks. Condiments: ketchup for dipping or grainy Dijon Mustad that the sediments fill each nook and cranny of the bread. Also great w/ a nice bowl of Chili or Tomato soup! I’ve been adding fresh spinach leaves to my grilled cheese sandwiches- that’s pretty tasty. In Scotland our grilled cheese is a very basic supper dish! We toast one side of a slice of bread, turn it over and cover with slices of tangy mature cheddar and then it’s back under the grill until it is bubbly and unctuous! Then you must grind lots of black pepper over it! Try a blue cheese and avocado combo for an absolutely fantasic grilled cheese sandwich. (And blue cheese is also great on top of a burger if you can take the carbs and fats).